Gearing up for Fall Fun! Fall is right around the corner and with that comes a thing that many of us love…FOOTBALL SEASON!! But where are you going to be watching your games? If you can’t make it out to the game itself, you can still watch in style with a brand new entertainment center or oh-so-comfy sofa. Have a look at some of our deals. How about this Essentials Lifestyle 73 Inch Console & Hutch Wall Unit by Aspenhome? Adorn your home entertainment room or living room with the contemporary design of this 73 inch console and hutch wall unit. It features clean lines and smooth surfaces encompassing a simple look. The console features four shelves and seven open compartments to house media devices, cable box, DVD’s, games, and decor. The hutch features even more shelves and open compartments that frames the TV set. Or how about this fine piece? The Ellenton Large Credenza with 2 Pier Cabinets Entertainment Center by Signature Design by Ashley is a contemporary flair entertainment wall unit features a rich espresso finish to create a perfect accent to your living room. A total of 10 shelves on each pier cabinet create spacious storage space for all of your entertainment accessories. Four wide shelves and 2 additional drawers featured in the credenza are convenient for organizing your DVD player, video games, and movie collection. Deeply scalloped drawers and doors create a unique “bow tie” look, echoed by pewter color faceted handles. Get creative and organize the credenza and cabinets in an asymmetrical design to fit your living room style. 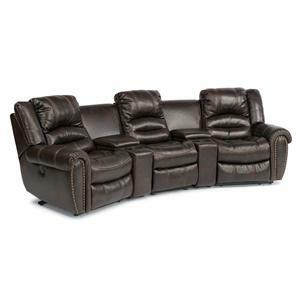 The Latitudes – Hometown Transitional Five Piece Reclining Home Theater Sectional by Flexsteel features the ideal blend of casual comfort and subtly stunning fashion. Adorning the plushly cushioned reclining sectional are pillow-padded mailbox arms with bold nailhead stud detailing. High density foam cushions wrapped in soft polyester fiber makes sure the seat and back have soft support that lasts for years of use. Also includes cupholder and storage, making it a perfect piece for your entertainment center. Pretty awesome, huh? The Wave Theater Seating by Stressless by Ekornes is named for the gentle waves of the ocean, the theater seating represents a true innovation in comfort technology. The piece automatically adjusts to each person the moment they take a seat on this amazing love seat. The patented Plus® and Glide® systems provide the perfect seating angle for truly customized support and the ultimate in individual comfort. Sit back and enjoy a favorite film with friends and family by adding this theater seating to your home. Drop by our showroom today to check out these amazing football season necessities along with so many other brands!